It’s been a full year since Donald Trump’s inauguration. Which means that it’s also been a full year since the 2017 Women’s March. The Women’s March is an incredibly inspirational event for a lot of people. It’s amazing to see so many women and allies gathering to fight for women’s rights and protest the Trump administration. To show that we’re still resisting a year later, the 2018 Women’s March is taking place all around the country on Saturday, January 20th. And you know what that means: Women’s March signs. In addition to tons of incredible speakers and the overall motivational impact of seeing so many people gather for good, the 2018 Women’s March comes with another hopeful beacon: the Women’s March signs! Ranging from shocking to silly to sad to heartwarming and everything in between, we can’t get enough of everybody’s Women’s March signs. So whether you marched, didn’t march, or just want an extra hit of female empowerment, here are 17 Women’s March signs that will fill you with hope for the future. And given the current state of the government (as in, we’re in the middle of a government shutdown), we could all really use it. 1This one from a precocious “Harry Potter” fan destined for greatness. 2These ladies who can’t believe they have to show up again but SHOWED UP ANYWAY. 3ALL OF THE YOUNG ACTIVISTS. 4This DIYer who gets it. 5This amazing, inspirational work of art. And it’s on a balloon. Incredible all around! 6This reminder of real hope for the future. 8This reminder that ladies are going to keep speaking up. 9And this reminder of what we should all aspire to. 10This sweet little girl with her sweet little sign! 11This reminder that, though it doesn’t always feel like it, there’s power in a ballot. 12This sign, because “Hamilton” will always fill us with hope and joy. 13This world-saving jacket slash sign. 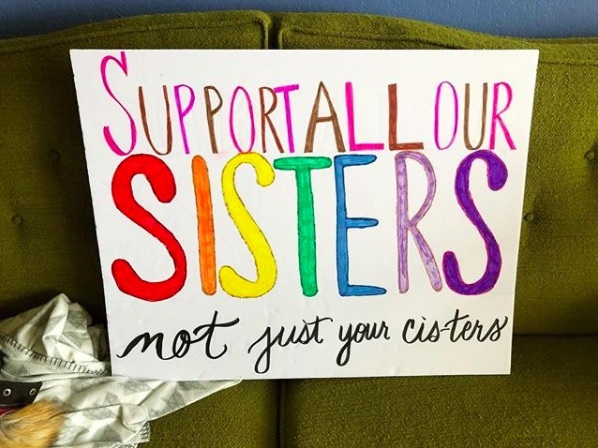 14This sign that gives us hope that we’re all going to hold each other to higher standards. 15This hope for future generations of women voters. 16This group full of hope and their amazing signs. The friends who protest together, stay together, as the old adage goes. 17And finally, this sign that makes us want a “We’re all in this Together” flash mob post-march.